Aluminium oxide (A) – to enable the grinding of high tensile strength metals such as steel, hardened steel, steel alloys and most ferrous materials. Note: Aluminium oxide can be of different purities, brown, white, pink and ruby. Zirconia-aluminium oxide (ZF) – a dense and durable abrasive. When combined with other abrasives, wheels for use when heavy pressure is employed can be produced. Sol-gel Aluminium Oxide (S) – is a specially manufactured crystalline abrasive structured for high stock removal when grinding exotic materials. Fused silicon carbide (C) – is an extremely hard material for general and heavy duty grinding of various types of cast iron, brass, bronze copper and aluminium. It is available in black and light green. The grain size of a grinding wheel is based on the sieve apertures through which the grain is sieved after crushing. 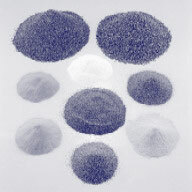 A 10 mesh sieve with 10 apertures per linear inch will give a 10s mesh abrasive after sieving. The FEPA (Federation of European Producers of Abrasives) standard requires that coated abrasives manufactured in Europe show a ‘P’ in front of the grain size to indicate that the product is manufactured to the FEPA P European Standard. As the grit size becomes larger, then the reverse is true.